Where do I get an Omega repaired? Hi I have an Omega automatic it worked flawlessly for about 20 year then suddenly started to gain a lot. I had it repaired by a local jeweler cost £200 it ran ok for about two years then started doing it again. I mean it gains a Lot. I would like it repaired properly. Any one any suggestions as to were I can get it done. Interests:Retired - but gamekeeping and stalking. Terry Casey. Just serviced two Rolex for me. I must admit to having a passion for nice watches I have about 5 watches. Not necessarily expensive watches but the Omega is my favorite. Any way thanks for the replies I will check them out. Interests:Target shooting in all forms; hunting for the odd pigeon or bunny; wristwatches; fountain pens. I had my Seamaster mechanical "serviced" and a new crown by one of those in Shuggy's post, went back twice and has never been right since. I got fed up of talking to the chap in question and now have a watch that if i do next to nothing keeps good time but on a busy day on the tools will gain 15 mins. I'd suggest you find a repairer with personal recommendation and preferably not too far away. I'm still looking for one to get it put right. I did contact Omega but was looking at over £600, which is not much less than i paid for the watch. Bit of a resurection, but further to my last post. Finally had enough of resetting watch and struggling with crown, this time went to another recommended independent, this one omega certified. Turns out the previous “ repair” was anything but, has caused unbalanced wear and now requires considerable amount of work to bring it back to omegas time keeping standard. First repair was done by Ryte Time. These have repaired and serviced my Rolex and Omega , very pleased every time. 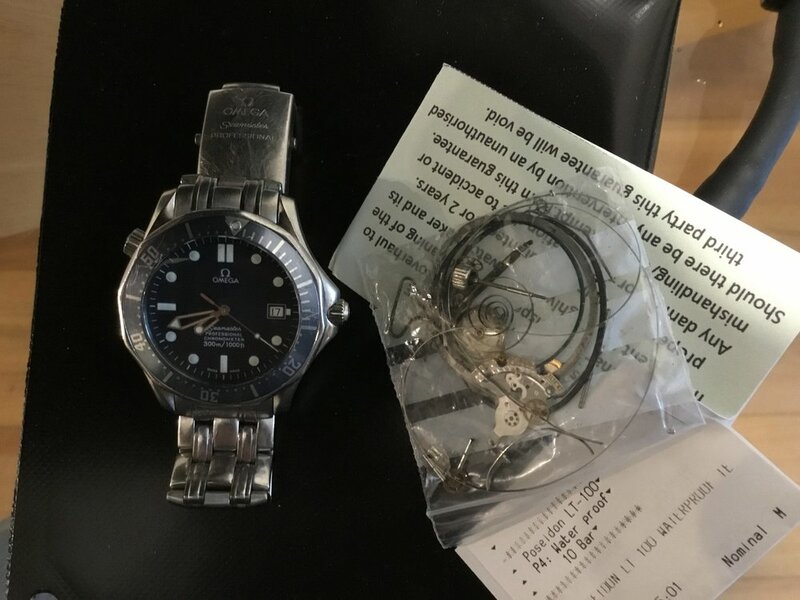 watch has already gone to thr new repairer , who has opened it up and given a detailed list of what needs replacing, omega certified, will be returned running to original spec and have a 2 year warranty. Fingers crossed it all works out. Just had mine serviced and a repair by Omega cost me £390.00 All the work is warranted by Omega. Watch has been repaired and returned, worn it for a month and no appreciable time has been gained or lost , power reserve is in excess of 28 hours. Work done by Robin Martin and Partner Portsmouth. Efficient, stuck to timescales, communicated well. Cost was £684, judging from the bag of bits returned, movement is half way to becoming triggers broom. 2 year warranty. Would have been more but I opted not to have the bracelet and case cosmetically improved. they are omega approved/accredited and costs are in line with those on the omega site. Very cool! Which Omega model is it? Here you go, along with the bag of bits replaced. I had my Seamaster serviced by Robin Martin. The shop doesn't look much from the outside, is an old fashioned horologists, with clocks everywhere. Some nice Rolex wall clocks in the form of large Submariners and GMTs, not for sale though. The shop can appear a bit manic out the front at times, but the chap who does the servicing comes out to deal with you personally, sticks the watch on the microscope viewer to show you what's what, keeps you updated and always meets timescales. If you need to send a watch somewhere, then I recommend them too. Or drive down to Portsmouth, drop the watch off, call in at Portsmouth Gun Centre on the way out of town.